What Can You Make With Two Yards? After washing my fabric for shrinkage, I took a measurement and was surprised that it was only 42 inches by 78 inches. That’s a little over two yards when I was under the impression I had bought 3 yards. It has both selvedges so I assume this started out as a 44 or 45 inch width. That seems like a lot of shrinkage! If the fabric started out as 2 1/4 yards then it shrank 2-3 inches in both directions. When I first started buying fabric I would buy 2 yards if I had a skirt or top in mind, even though I can make a sleeveless top with 1 yard and probably some skirts as well. Three yards seems to me would be enough to make most knee length dresses. Of course, if you buy fabric especially for a particular pattern you won’t have this problem and can follow the envelope yardage requirements. But I bought some fabric willy-nilly a few years with only a vague idea of what I might use it for. 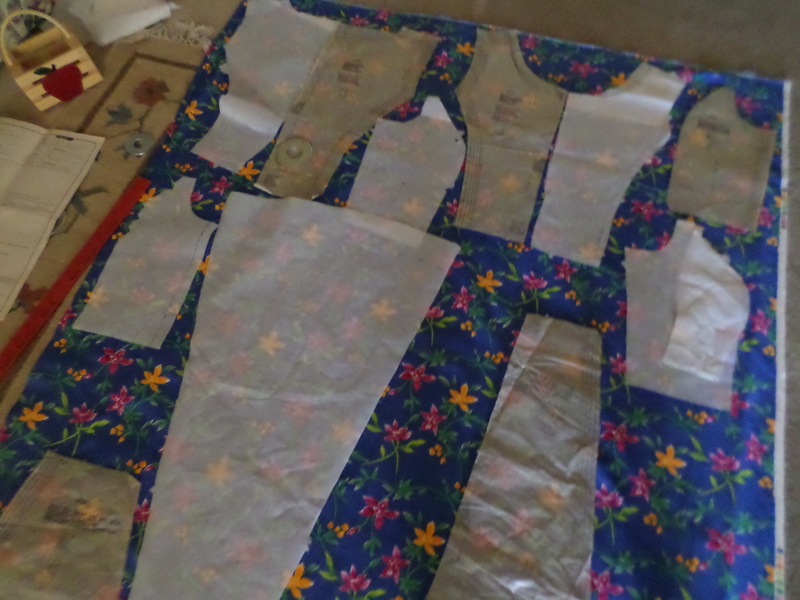 I tried laying out the pattern pieces and realized it wasn’t going to work. Although New Look 6020 can’t be made with only 2 yards, I decided to keep the princess bodice and change the 6 skirt panels of the pattern to a flared skirt with a single front and 2 back panels for a center zip. I want to make a dress with this fabric! I am going to line with a cotton lawn. I’ve looked up how to line a sleeveless dress, and decided I’m going to use the method of leaving the side seams open on both the dress and the lining and then attaching at the neckline and armholes and turning right side out through the shoulders. Hopefully, I’ll figure it out when I come to it. 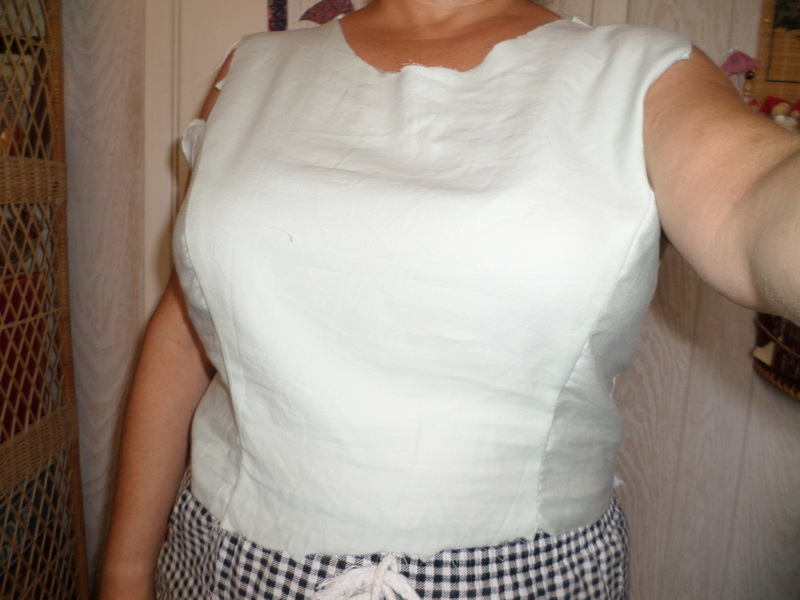 I’m still tinkering with the bodice. I have a new invisible zipper foot and a 14 inch zipper, which reaches my waist. So , although I can’t make 6020 exactly as planned with 2 yards, it should still be enough to make a dress for me. 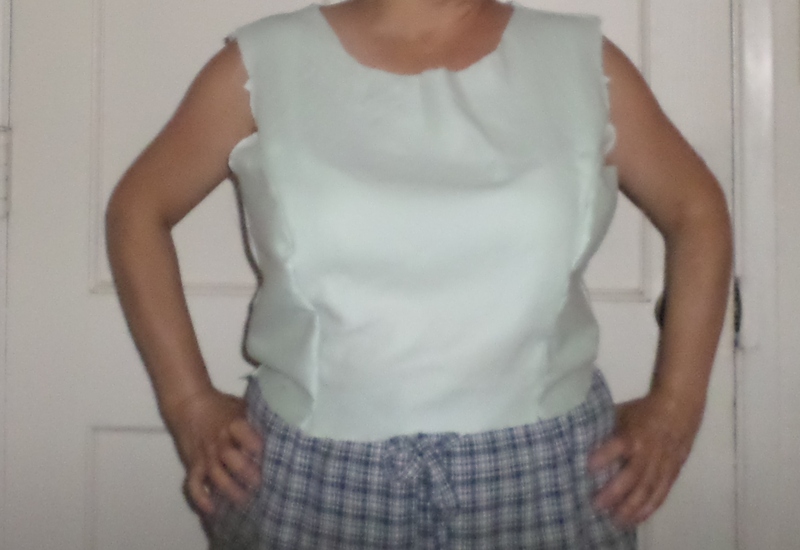 This entry was posted in Sewing and tagged fabric shrinkage, new look 6020, prewashing fabric, yardage requirements on July 31, 2013 by Stitch It Again. I’m constantly adding links to my pinterest board titled Sewing Knowledge. When I need help with a technique, I look at 2 or 3 different entries because there are different ways of doing things. I like online learning because it’s so instant – just search and there are plenty of photos, instructions, and even videos to help me figure it out. Sometimes I get old school and open a book. My main reference books are: The Reader’s Digest Complete Guide to Sewing published 1976 and the Singer Sewing Book revised edition published in 1972. I also like the two softcover reference books given to me from my stepmother’s garage. Simplicity Sewing Book, published in 1962, gives you some basic information, then it takes you through the sewing of seven basic garments, and finishes with more technical information by category. The Complete Family Sewing Book, published in 1972, was a bargain sold at the discounted price of $1.59 at Pic ‘n’ Save and features hip drawings and over 400 pages of useful fashion and sewing information. 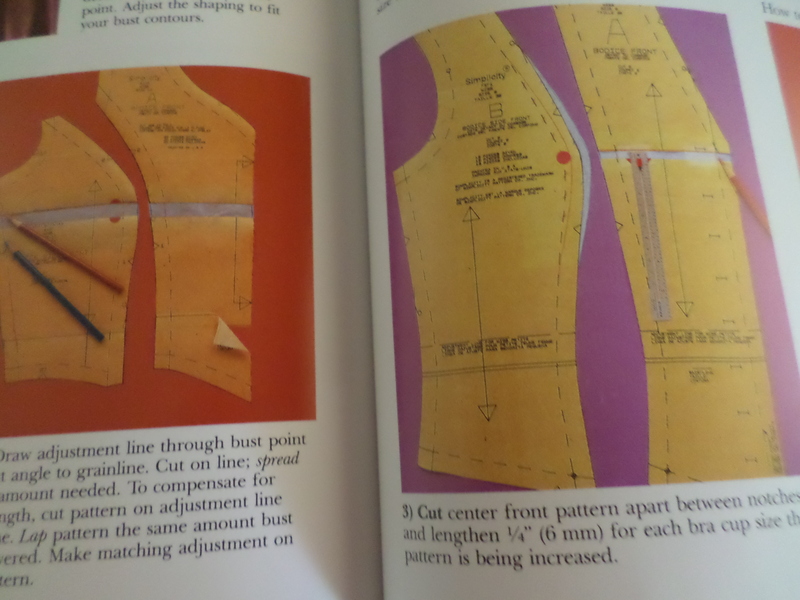 When I was at the library recently I checked out a technique book I found, “Power Sewing Step-By-Step” by Sandra Betzina. Sandra has written many books, designs Today’s Fit patterns for Vogue, and teaches classes on Craftsy. One part of her master construction methods of interest to me is the segment on flattering grainline choices for skirts. Sandra says the best skirt for all figures has the grainline centered in the middle of each skirt panel. When the skirt’s grainline is parallel to the center front the fullness hangs at the sides with a flat center front and center back. It makes your hips look fuller. If the grainline is parallel to the side seam, the fullness is over the stomach and backside which adds width to these areas. When each skirt panel is cut with a centered grainline the fullness is evenly distributed. Her instructions for centering the grainline on “cut on fold” pattern pieces tell you to add seam allowance and cut two pieces instead. Hmm, I don’t think I’d want to do that. I’d rather find a flattering silhouette by choice of skirt type: for example, the shape of an A-line skirt gives me a better line than full gathers. As a beginner, reading too much on techniques is confusing me; I have a tendency to get bogged down in details and over think everything. I ‘m also really bad at understanding a technique from just reading the instructions; I have to be actually following along trying to do it myself in a garment I’m working on, for it to make sense. I enjoy browsing through sewing books, but there is no replacing your own hands on experience, keeping it simple, and learning as you go. Do you have favorite reference books or do you search online? This entry was posted in Books, Sewing and tagged centered grainline, Power Sewing, Reader Digest Guide to Sewing, Sandra Betzina, sewing reference books, Simplicity Sewing Book 1962, Singer Sewing Book, The Complete Family Sewing Book on July 15, 2013 by Stitch It Again.